Best Choice Products is proud to present our brand new Wooden Chicken Coop. This wooden coop is designed to not only house chickens, but can be used for keeping roosters, rabbits, ducks, or other small animals. The coop includes a ramp that allows chickens to enter the raised housing area through a sliding door giving them plenty of space. Solid fir wood construction helps keep this coop durable and able to be used for years to come. The housing area comes with a removable bottom sliding tray for easy cleaning. This cage also includes a nesting box that has an open/close rooftop and metal locking system that gives you access into the cage. This will allow you to give your animals food and water, to clean their living area, or to collect their eggs. Order this spacious chicken coop for the most durable and fully equipped cage today. RECOMMENDED: Sealing coop when you first purchase to protect it and keep it lasting longer. This wooden coop is designed to not only house chickens, but can be used for keeping other small animal. Ordered the coop on a Friday evening and it arrived that next Wednesday. Delivered by Fed ex in two large slim boxes. The way the materials were packed was amazing. Wood is good quality and we loved the fact that the wood also had holes pre-drilled. When all put together very well made and sturdy. We are adding some shingles to the roof and treating it with weather resistant deck stain then the girls should be ready to move into their new home. We have 6 chickens and this is a good amount of room for them. 2 nesting boxes and 2 perches. Plenty of space for all . My family loves this chicken coop. It's really cute for a starter coop. It really wasn't that hard to put together. My husband looked at the instruction, to guide us in putting it together. my 10 year old daughter put it together and I help hold everything to be put together. It took about a couple of hours to put it together. Because the picture directions could have been a little more clearer. But, all in all not that bad. It's so cute. I am enclosing 2 pictures. My daughter is 2 inches shy of being 5 ft. tall. 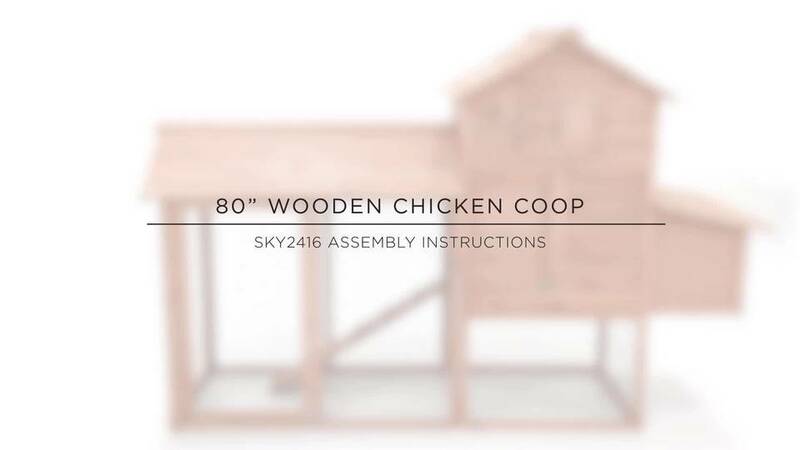 I would recommend this chicken coop. I bought this at the end of February and I have enjoyed it. I have 3 bantam and they have more than enough room. Easy to assemble. All I used was a screwdriver. The coop arrived yesterday afternoon in two flat boxes. All the panels came assembled (mesh, roof panels, sides) and simply needed to be screwed together. All the holes were pre-drilled so I didn't have to guess. It was quick and fun to do with a cordless drill. Before I assembled anything I painted every square inch of the wood with a clear sealant (not included). The wood is naturally white and stained orange. The wood is soft and light-weight so I consider the sealant a required step to extend the life of the project. During assembly I applied wood glue (also not included) to all the wood-to-wood connections. In my opinion, I don't think this pen would last more than a year or two out in the elements without protecting the wood and gluing the connections. It's just not heavy and solid. I have the coop set up in the shelter of a patio. I'm expecting it to last the life of the three chicks we're raising, maybe longer. The hinges are adequate but I expect I'll be replacing the screws during the life of the pen. The wood is soft and screws are small. They will need some maintenance. The slide-out cleaning pan is nice. It's galvanized steel with a wood frame so it can be scraped clean and reinserted. There are two perches right over it. The nesting area cantilevers off he back and has a slat floor. The slats and divider panel are easily removed for cleaning. Droppings and nesting material can fall through the slats. I looked at a couple different styles before purchasing this one. I'm sure they're all made in the same factory in China. I like the styling of this coop and look forward to moving my chicks outdoors. I'm pleased with the purchase. It was inexpensive and I expect to have to do some maintenance over the years, but it sure beats trying to build one myself. Love your review! Thank you so much for taking the time to review this item and to give the readers on our website some DIY tips. Best wishes to you and your chicks!